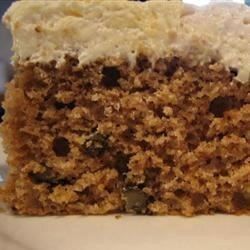 "You need just one bowl and one pan while preparing this quick and delicious spice cake with applesauce and pecans." Sift flour, white sugar, soda, salt, baking powder, and spices into a large mixing bowl. Mix in 1/2 cup butter or margarine, buttermilk, and applesauce. Beat for 2 minutes with an electric mixer on medium speed. Beat in eggs. Fold in 3/4 cup chopped nuts. Pour batter into a greased and floured 9 x 13 inch pan. Mix confectioners' sugar, cream cheese, and vanilla until smooth. Melt 1/4 cup butter over medium heat, and add 1 cup chopped pecans. Keep stirring until browned. Stir cooled pecans into cream cheese mixture. Frost the cooled cake. Just okay ... I've had better. This was a very flavorful and tasty cake. I would definitely make it again. However, my cooking time differed drastically from the recipe. My cake was done in 25 minutes. Very good cake. We liked the flavor of the cake and the nuts in the frosting. But the frosting was a little too sweet.